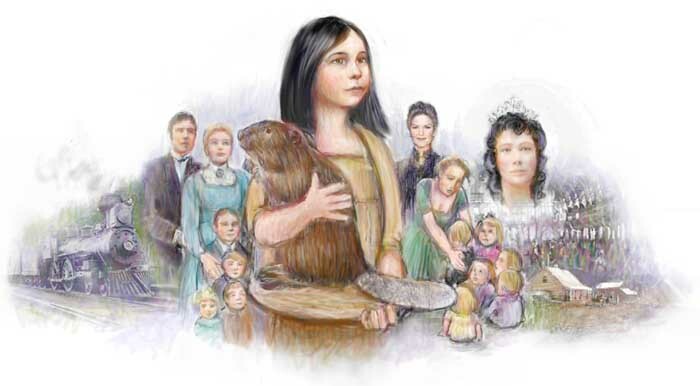 This story in three parts,describes the journey of self discovery in the 1870's New Brunswick Canada, and also south towards Maine and Boston, who looks 'Indian' and learns she is an orphan when she is nine. Her journey takes her from Fredericton, to Saint John, to the wilderness in the interior of New Brunswick, back to the Saint John area, then to the rural area south of Moncton, and back, and involves Boston, the interior of Maine, and the epic poem 'The Song of Hiawatha' which was a very popular depiction of 'Indians' in those days. In the course of her three stages of adventures she discoveres her Indian identity, learns who her birth mother was, and ...well it all ends happily at the end of Part Three. These books are intended for younger readers (13-16) who might identify with Abbi, who, although 9-10, is mature ahead of her years. The stories try to reasonably reflect the nature of New Brunswick and New England around that time period, and it involved considerable research in the spirit of writing true historical fiction. NOTE: Currently the author is searching how to break this lengthy book in three parts into a trilogy - which is more desirable than one large book. If you view the current version, do not be surprised if such a revision is done. All creative work by A. Paabo has automatic author-artist copyright. Contact author if you do more than read the pdf file. A.Paabo, Box 478, Apsley, Ont., Canada - comments and inquiries welcome.